Cricket in the Emirates without Sharjah? But why? Inside one mall, you can ski down an 85 metre slope — about the height of 25 storeys — perfectly snow-clad, all year round, even if the temperature is pushing 50°C outside. In another, you can get in a protective cage and, wetsuits and breathing gear in place, feed sharks, even as experienced divers draw them to you. In a third location, you can experience the thrill of sky diving, without being anywhere near the sky or even jumping, forget about diving — the wind tunnel doing all the work for you. 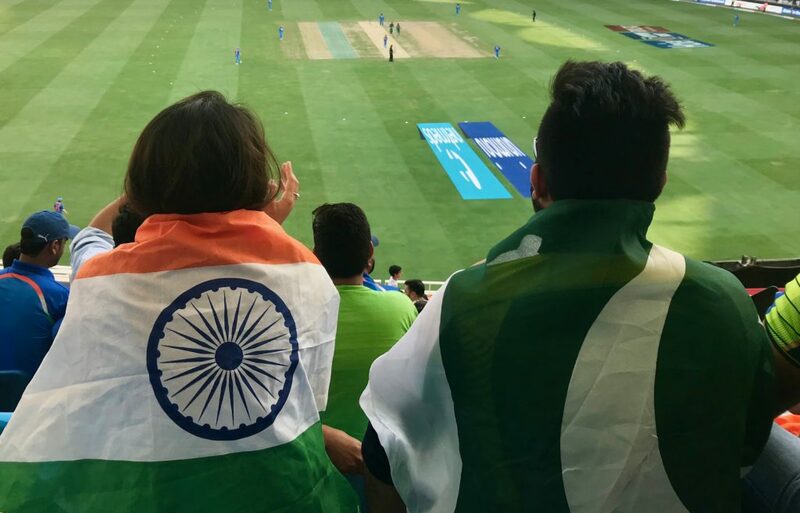 What’s it like to watch an India-Pakistan match in the stands with an Indian-Pakistani couple? India v Pakistan, were you there? India plays Pakistan in Asia Cup match in Dubai today. Need more be said? There’s a huge difference between the way cricketers approach a game and the way fans and supporters approach it. If ever proof was needed, one should look no further than an India-Pakistan match. It does not matter if the match is a dead rubber at the end of a bilateral series, a World Cup match, or what’s unfolding now, the Asia Cup. 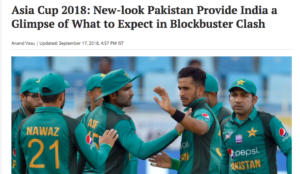 Why, there’s a distinct possibility that India could play Pakistan thrice in this short tournament, if the results work out right. How’s that for managing a mini-series even when the governments can’t agree to play each other bilaterally? The gates at the Dubai International Cricket Stadium open at 1.30pm for a 3.30pm start in the match between India and Hong Kong.There’s a bit of a crowd milling about, and a decent number in the stands. The empty seats look worse than they actually are because this is a big stadium, seating up to 25000. Once the toss is done, though and news spreads that India are batting first, there’s a steady inflow. 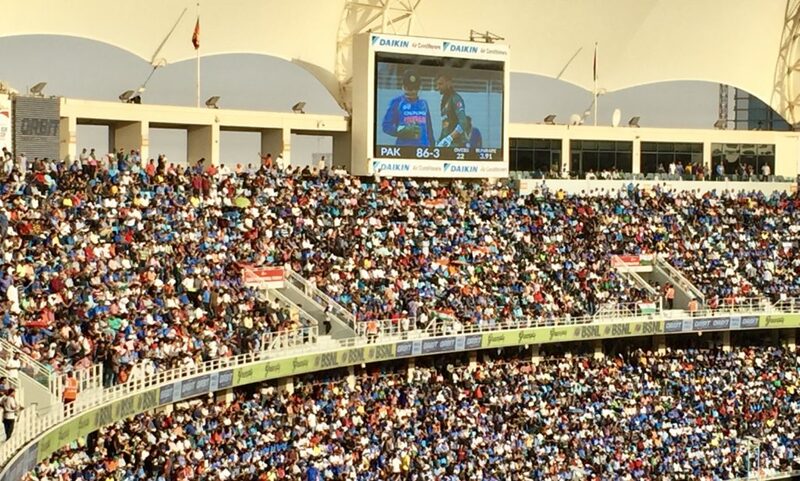 The number of blue India shirts in the stands steadily increases, tickets in the AED 45 and 75 categories still being available for the match. Will Vinod Rai reply to the third letter he has got on a serious subject? Who is Aditya Verma? Until recently, he was an unknown official from the unrecognised Cricket Association of Bihar, but in recent times, he has become the most litigious cricket board official of all time. It is an open secret that he was used to file multiple cases against board officials, and that the lawyers who spoke for him were among the most expensive in the country and paid for by vested interests, but all those suits were heard. When neither party in an argument is right or wrong, where do you go from there? There is a special kind of impasse in which nobody is right, nobody is wrong and yet no reasonable agreement is possible. 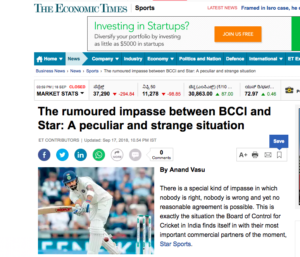 This is exactly the situation the Board of Control for Cricket in India finds itself in with their most important commercial partners of the moment, Star Sports. Star is pumping in close to Rs. 24,000 crore to Indian cricket for the broadcast rights of matches played in India and the Indian Premier League, over the next five years. When you put down such a large sum of money, there exists a reasonable expectation of being treated fairly, if not well. 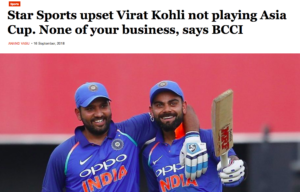 So, when Virat Kohli was rested for the Asia Cup, in which India could potentially play Pakistan three times, it should have come as no surprise to executives in the BCCI that their counterparts at Star would be less than pleased. So, when an employee of Star wrote to the Asian Cricket Council, who are organisers of the tournament, pointing out that the BCCI had a responsibility to the tournament and its broadcasters, it’s fair to say he was not trying to act high-handed, throw his weight around because of the cash his company is forking out, but that he was merely doing his job. Is it possible to feel empathy for a larger cause even when your team loses? Is it necessary to feel sympathy for a team that loses matches it should have won? 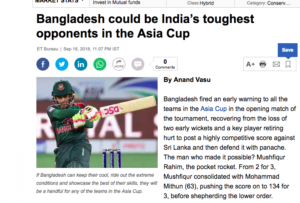 Is it relevant that a team that won a World Cup can’t even hold its own in an Asia Cup? 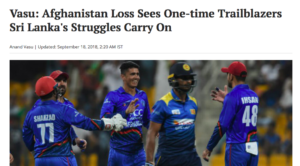 The short answer is that any tournament is poorer when Sri Lanka are eliminated early. Cricketers from Sri Lanka are not merely skilful, they are usually fairly unique, exceptionally talented and the kind of gents you would welcome into your home. Mercurial Pakistan? Not as much as you think. Two Indians have already felt the full force of what this Pakistan team is capable of in the Asia Cup. Well, in a roundabout way. Anshuman Rath, Hong Kong born and bred in England, in the fabled Harrow school where he took up a place as a boarder at 14 to pursue cricket was dismissed by Faheem Ashraf and Kinchit Shah, born in Mumbai but having played for Hong Kong through age-group cricket, made 26 before Hasan Ali got him. Bangladesh fired an early warning to all the teams in the Asia Cup in the opening match of the tournament, recovering from the loss of two early wickets and a key player retiring hurt to post a highly competitive score against Sri Lanka and then defend it with panache. The man who made it possible? Mushfiqur Rahim, the pocket rocket. From 2 for 3, Mushfiqur consolidated with Mohammad Mithun (63), pushing the score on to 134 for 3, before shepherding the lower order. There is trouble brewing between Indian cricket board and Star, the host broadcaster of the Asia Cup. A sharp exchange of emails between Rahul Johri, the BCCI chief executive, Thushith Perera of the Asian Cricket Council, and Sunil Manoharan, a senior executive at Star, accessed by ThePrint, lays bare some serious issues of disagreement over the selection of the Indian squad for the tournament that has just begun in the United Arab Emirates.